After a wonderful evening at the Orsay Museum the first night we arrived in Paris, we woke up feeling, well, hungry! We headed out to breakfast at Angelina’s, not the cheapest breakfast in town, but a treat nonetheless. 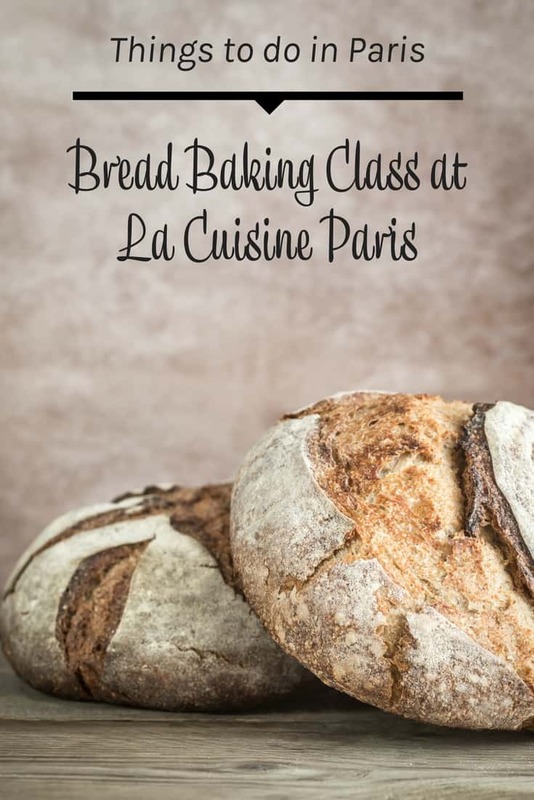 We didn’t want to wander too far as we were headed up the street along the Seine to the beautiful La Cuisine Paris cooking school so that we could learn to make baguettes. Bread is a dangerous thing in the Misadventures household, both the mister and I can demolish a baguette at a single meal. 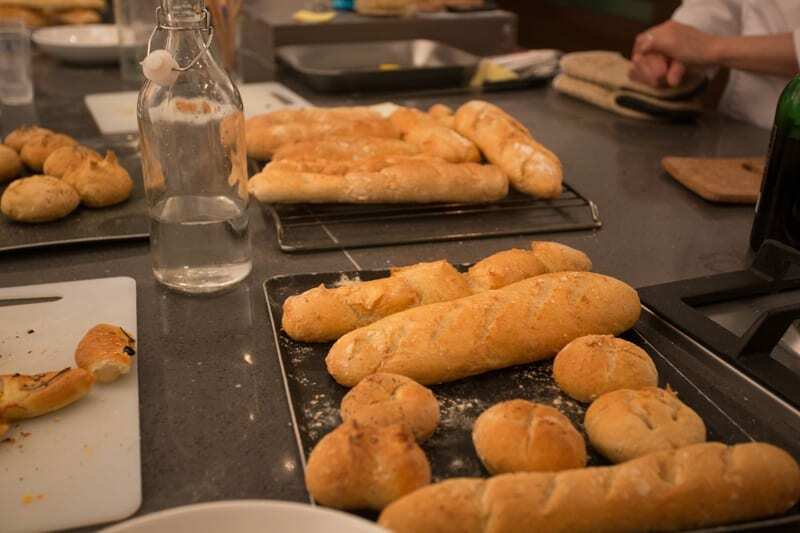 So the idea of learning to make baguettes was certainly playing with fire! But I had visited La Cuisine Paris the year before and thought learning to make something we love would be a really fun way to spend a few hours during our trip. Our class of 8 students was made up of visitors from all over the world who visit Paris often and had the same idea to learn something new in the city they love. We all instantly bonded with our instructor Diane over our love of France, Paris and French bread! Diane was an excellent instructor with a wonderful sense of humor that made our three hours together so enjoyable. She clearly explained the ingredients and every each step of the process for making bread. She told stories, asked questions, teased people and made the class so much fun! I don’t have a lot of pictures during the bread-making process as my hands were full of flour and dough which doesn’t mix well with my camera! We made baguettes and dinner rolls and fougasse. 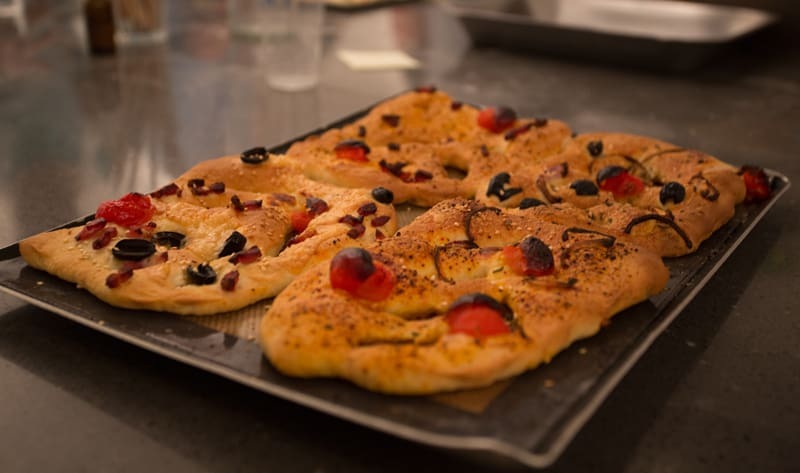 Fougasse is a flatbread from the South of France that you can add ingredients too, like a pizza. Once we baked all our bread we ate them! Despite the fact that only one of the eight students had ever made bread before, I’d say we all did a pretty good job! Of course, we had Diane to help us and keep a watchful eye, but I certainly enjoyed the process of “getting my hands dirty” with the flour and dough! If you are looking for something fun to do while visiting Paris, there are dozens of courses you can take at La Cuisine Paris. Some in their beautiful school across from Île Saint-Louis as well as out in the farmer’s markets throughout town. You can learn to make bread, pastries, including macarons (!) as well as French specialties like souffle or learn about cheeses and wine. Something for everyone. Mr. Misadventure and I will be back to learn more…I’ve got my eye on the croissant class! How about you? Have you taken a cooking class in another country? Have you tried to bake baguettes at home? Do tell! That sounds incredible, I would demolish the whole lot in one go! @Naomi, I definitely ate my fill! Sounds so fun, but I bet the best part was the eating part! @Colleen, darn it, I wish I would have thought of the Julia part! I went on a Context Tour in Paris in the neighborhood she used to live in and I had so much fun trying to imagine it through her eyes! 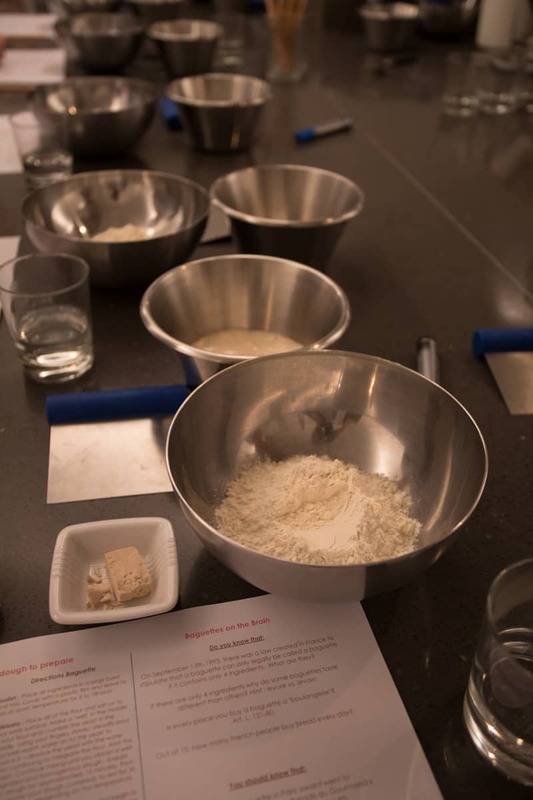 I loved the bread class at La Cuisine, and the croissant one and the macaron ones… you get the picture! 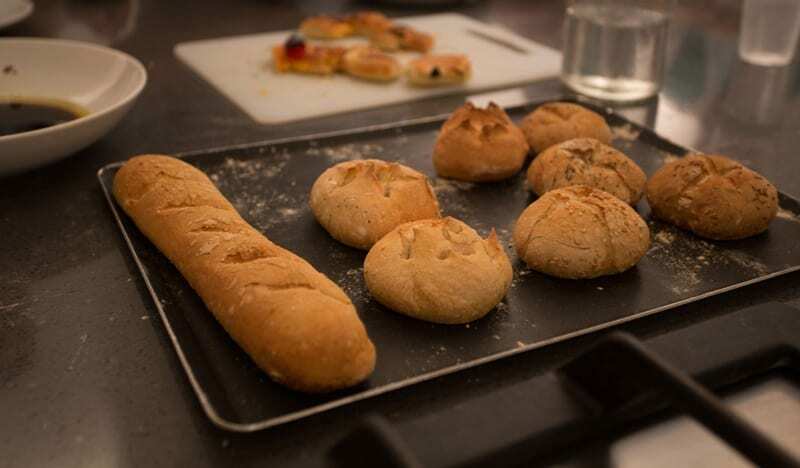 I was impressed with the breads the class produced too! Diane is a wonderful instructor and I can’t wait to go back next summer to take another class with La Cuisine! @Mardi, the whole school is wonderful and I know you have spent a lot of time there as well. Such a great way to “visit” the city! I would like the croissant class as well, it seems that would be one of most challenging pastries to make at home. I’ve heard a lot about this class from other bloggers too. Definitely seems like it is worth the travel! @Murissa, the school is great, and such a fun way to spend time in Paris. I think croissants are more dangerous than bread…all that butter! @AndiP, I do! This one was funner! @Bron, which class are you taking? Teacher Diane!!! I took two classes with her! I adore her and La Cuisine. @Hilary, what classes did you take? Diane was hilarious and talented! I took the macaron and Crossaint class with her. Then we randomly ran into each other in the St. Germain neighborhood and she took me on a tour of her favorite patisserie! Now that is customer service!!!! I heart La Cuisine. @Diane, that sounds just like Diane! 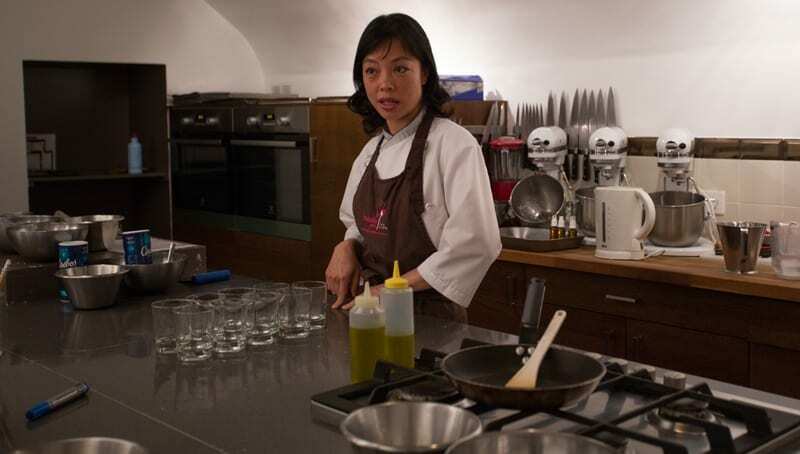 I’m going to Paris next spring and have been thinking of taking a cooking class – and this sounds like a good one! @Laura, the classes are great and the school is run by wonderful people! Those look incredible!! Was the class taught in English? This is definitely something I’d do next time I’m in Europe. And has M. Misadventures been baking up baguette after baguette since the class? @Daisy, no! We have been busy exploring bakeries in our area…probably this winter we’ll get around to trying it at home. I adore La Cuisine, and have yet to try this class, looks incredible! And what a feast afterwards!! Glad you and the mister enjoyed it so much! @Kasia, I think you would like the market tours. What an amazing experience for you! I would love to do this myself! What an awesome experience! I love taking classes in locales: next Spring I am taking a foraging class in Crete – i can’t wait! 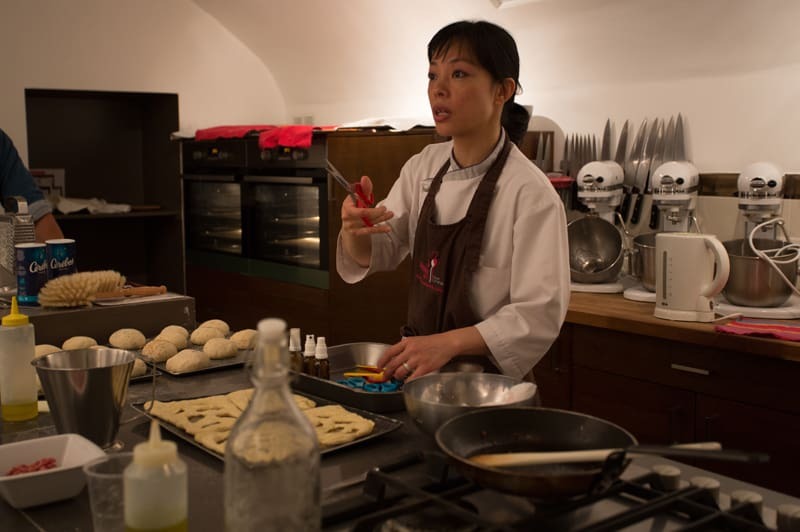 Wow, that sounds like a dream come true.– to be in Paris and learn how to make their exquisite bread. Thanks for sharing. It’s always nice to visit Paris for a moment! P.S. Love the look of your site. I’m a French fanatic too.